Teleporter gathers all your teleport abilities and items into one place. The teleporter button has two states - grey (unlocked, can be moved), blue (locked, cannot be moved). Right-clicking on the teleporter button will toggle between locked and un-locked states. If the button is locked, then the popup menu of teleports is accessible. - A mouse icon indicates that it is in CLICK to show mode. - A hand icon indicates that is is in MOUSEOVER mode. Using the mousewheel on the button will adjust the scale of the teleporter entries. /teleporter fade N - Sets the fadeout time when your mouse leaves the popup menu before the menu is removed. Note: If you have Docker installed, then the movement and locking options are inactive - Docker will handle placement of the button. - Made popup window fade rather than disappear immediately. 1.9r8 - Removed some fixed localisation and replaced data with values generated at runtime from the client. + Refined item detection, so should only show the ones you have. Hello And thank you very much for all your hard work in creating this addon and all your other rift addons. I would just like to point out a problem with using the docker addon with this addon. This and your Rifter addon both pop out from the mouse in different directions. The popup for teleporter appears with the top left of the window under the mouse, so to the left and down from the mouse. The Rifter popup window appears to change direction depending on where the icon is placed, which is great..
Because of this, the docker icon can never be placed on the right or bottom of the screen because the popup windows will appear off of the screen. Also, when the docker direction is set to UP, the icons for the teleport spells appear under the other docker icons. So because of these factors, the docker cannot be used at the bottom of the screen, and the UP or DOWN options cannot be used. The only reasonable position is at the top left. It does attach itself on loading so that it appears in a sensible direction, but if you move its location it doesnt detect that and refresh. Rifter on the other hand checks everytime it opens - which is what the above 1 line change will make TP do. Last edited by adelea : 03-21-15 at 01:41 AM. Last edited by twistdshade : 03-20-15 at 04:26 PM. [description] => Allows access to remotely enter the porticulum. 30 minute cooldown. Woo! It's addon development, and i helped! Yeah, they would fit - will add them in! Error: Teleporter/Teleporter_Main.lua:534: Error in coroutine: Incorrect function usage. 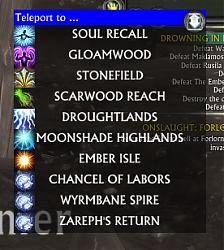 Parameters: (Frame: Teleporter.f.frame.0x2c925fa8), (userdata: ), "cast Soul Recall", "Event.UI.Input.Mouse.Left.Click"
Not permitted on a frame with "restricted" SecureMode while the addon environment is secured. callback:	A global event handler function. This will be called when the event fires. The first parameter will be the standard frame event handle, any other parameters will follow that. label:	Human-readable label used to identify the handler in error reports, performance reports, and for later detaching. priority:	Priority of the event handler. Higher numbers trigger first. Wow, no idea how I didn't see that. Think my brain just focused on the big red bar that shows up and expected the timer to be inside the tinted window/that big red bar to be the timer itself. Would it be possible to have the menu only show up when you click the button instead of hover over it? 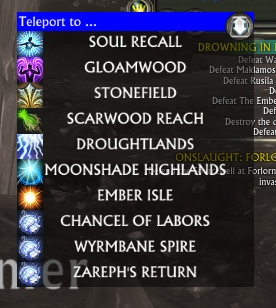 Can be pretty annoying to have it show up when randomly moving my mouse around while waiting to respawn/preparing in raid or PvP. Thankfully you have it not show up during combat which is nice. EDIT: A timer for the cooldown on the teleports would be great as well. There is a timer - red text to the left of the icon. I'll see what I can do about the popups. Last edited by AlienFromBeyond : 09-11-12 at 01:20 PM. shared.lang["MOONSHADE HIGHLANDS"] = "Hautes-Terres d'Ombrelune"
If you mean what I think you mean, then it's not me missing off the ends of the letters -the available space goes all the way to the edges, the client is doing that.